Welcome to our quaint little village. Climb over the makeshift barricades, slip into the pub, and pick yourself up a pint. Might want to shave any scruff you have, people here aren’t too welcoming to particularly hairy people – might turn into werewolves, you see. And you don’t want to draw any negative attention – particularly not from the two werewolf hunters that roam the streets and put down the feared beasts. Who knows – perhaps you might aid them in their goals? Yggdrasil has provided some stunning visuals here, making a really atmospheric backdrop. The title is played on a 5×3 playing field with 20 paylines and has several special features, which can be activated through collecting Scatters, or by filling up the meters on the side of the reels – or emptying the one at the very top of the reel, allowing the game to reward both medium and long-term engagement, while still keeping the random element of bonuses included. Wolf Hunters has a medium to high volatility – it’s not as bad/good (depends how you see it) as high variance games when it comes to hiding its jackpots, though you’ll still need to work for any big wins. It has an RTP of 96.3%, which is solid. But, it’s not the loosest Yggdrasil slot – that would be the Jokerizer with 98%. Fantastic theme – Just taking a single look on the reel, you’re able to get a feel at how bad the situation is, and just imagine yourself there. Everything is hidden behind massive gates, and everything left in front of them is decaying, tossed around and abandoned, as trying to retrieve it is just asking to be werewolf food. Rewarding long-term engagement – While you can activate the bonuses by getting the right symbols, you can also skip straight to their empowered versions by filling up the two reels on the side, which rewards players for sticking around for a while. Meanwhile, the meter at the top will take a while to empty, which will keep players coming back in hopes of getting the prize behind it, as well. If you’re faced with some horrible luck, it also provides a way to hit bonuses anyways and circumvent the problem slightly. Takes too long – Part of it is without a doubt due to the fact it leans on a higher variance of things compared to the medium one, but it can take a while for anything to really happen here. If you have patience and deep pockets, this won’t be a big problem, but if you’re hoping for something short, sweet, and to the point, this isn’t the slot for you. There are several special features available in Wolf Hunters. Getting the male and female hunter on the first and fifth reel rewards ten regular free spins. 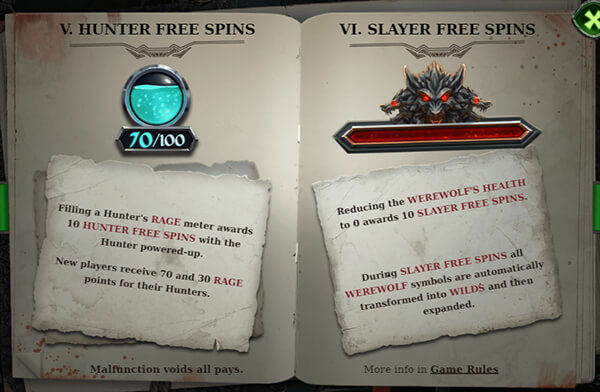 During free spins, hunters have a bigger chance of winning their duels if a werewolf symbol appears. Collecting three of that respective hunter’s symbol during free spins will power up that hunter, which adds more free spins and expands Wilds either to the left for the male hunter, or up and down for the huntress. Each hunter has their own rage meter that fills when that hunter wins a duel. New players start with 70 rage in one meter and 30 rage in the other. Once it reaches 100 rage, it empties, and you receive 10 free spins with that hunter empowered. Reducing the werewolf’s health to zero activates ten Slayer free spins, during which all werewolves automatically become expanding Wilds. It’s a shame Yggdrasil isn’t more popular, because the games they create are absolutely fantastic to play. Wolf Hunters is just about everything we could have asked for from a medium to high variance title. It has our glowing recommendation.